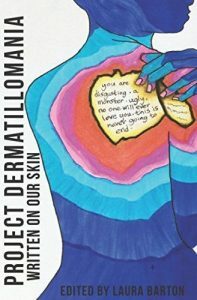 In being the second title in the series, Project Dermatillomania: Written on Our Skin (PD2) provides a vivid look into the lives of many women who have Excoriation Disorder (aka “Dermatillomania”). The 116 pages of this collective includes poems, personal stories, and artwork that conveys the severity of this often misunderstood disorder while providing intimate insight into the lives of the 19 contributors of this book, including its author Laura Barton. For the sake of full disclosure, Laura and I have a friendship that grew through our passion of spreading awareness about Dermatillomania and other BFRBs. We have worked together with the Canadian BFRB Support Network since its founding in 2013, with my contributions being mainly online due to not living in Ontario. I had the opportunity of meeting her at the 2015 TLC Conference in Washington, DC and have always admired her tenacity and will, along with her dedication to the proper dissemination of facts about BFRBs. 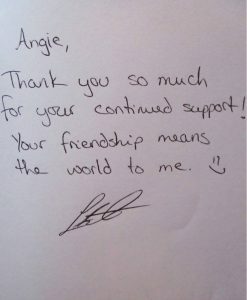 When I first received my copy of PD2 I was excited to see if she had autographed it, which, to my delight, she did! After thumbing through the book I was struck by how structured the template of the book is with contributor’s names, pictures, and locations being listed (or anonymously) in an engaging format that allows you to recognize that the words and images included in this book are written by real people who have had to travel down the isolating path of having Dermatillomania- which is evident throughout every submitted piece of work in PD2. Upon receiving my copy from Laura, I had a worry about the length of this book. While it is only 16 pages longer than the first part of the series, Project Dermatillomania: The Stories Behind Our Scars (PD1), I feared that with many more contributors that it wouldn’t have as much of an impact on me as PD2’s starting book did. In reading through roughly 30 pages, I realized how emotional the content is and it exceeded my expectations. The introduction is immediately inviting, as you read that this book started as a thread from Barton asking people in an online skin picking forum to contribute to it. In our tight-knit community, I know a few of the names in the book and was excited to see their accounts of living with Excoriation Disorder. 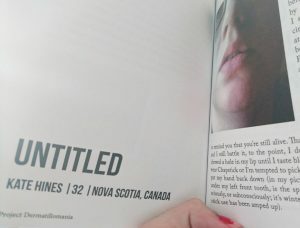 I was surprised to see an unfamiliar name with my province listed under “location”, which was Kate’s story from Nova Scotia! Seeing that someone only 1 year older than me lives nearby is further confirmation that I didn’t have to be alone growing up had there been awareness and resources available to bring this issue to light. Doris’ addition to PD2 struck me because of the similarities in the way we convey our story. While my path didn’t lead me to a Master’s degree, the need for perfection in various aspects of life (including academia) resonated with me along with the speech she uses to present her experiences with this disorder. One of the women I’ve seen in the forums, Nikki, has a unique story with a life of struggles, which I relate to in severity although not in occurrences. She became a therapist to be a beacon for those with Dermatillomania and her honesty about her flaws as a human being only solidifies her position as a compassionate therapist who is dedicated to helping those who are suffering despite her own struggles. Kimi’s story was interesting because of the cultural differences she discusses. The part that sticks with me is how she was first introduced to the feminine culture of Avon meetings with women transfixed on beauty products, which was a foreign concept to her. It makes me think more about the push on women to appear flawless, which can be a driving factor in having Dermatillomania. She also talks about familial ties and each one’s reactions to her picking despite having their own mild to moderate forms of this disorder. The criticisms I have of this book pale in comparison to the benefits of having read it for further insights from everyone who contributed to this book. I caught a few minor errors and the lines were closer to each other than I had anticipated. A detail I am torn about is how many contributors included a definition and explanation about the disorder in their section; while it’s nice to hear how each person sees Dermatillomania, it occurred too often which took away from what else could have been included. With Laura’s explanation of it in the introduction, I found that book may have benefited from this repetition. It is not the fault of anyone involved but if this series continues, as I expect it might, I would like to see more stories from people of different regions, races, ages, genders, sexualities, religions, and socio- economic backgrounds to add to the whole picture of who Dermatillomania affects. I would rate this book a 9.5 / 10, which is the same rating I gave for PD1- but for different reasons. Aside from the personalized template I enjoyed seeing more references to outside resources, something Barton admits happened due to the insurgence of awareness over the past few years and her experience in already having written a book. The striking depth in the poetry showcases the talents of each individual while the placement of artwork is a wonderful transition from its heavy, yet relieving, emotional content. Similar to the its book, Project Dermatillomania: Written on Our Skin is another book that is guaranteed to make you feel less alone if you have this disorder. 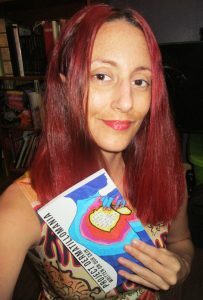 If you would like a copy of either Project Dermatillomania books, please visit its website. follow Project Dermatillomania on Facebook and Twitter to keep up with potential opportunities! To read more from Laura Barton, check out her Facebook page and see her articles from The Mighty, Healthy Place, Healthy Minds Canada, and more!